Don't Panic! Have A Volcanic!! 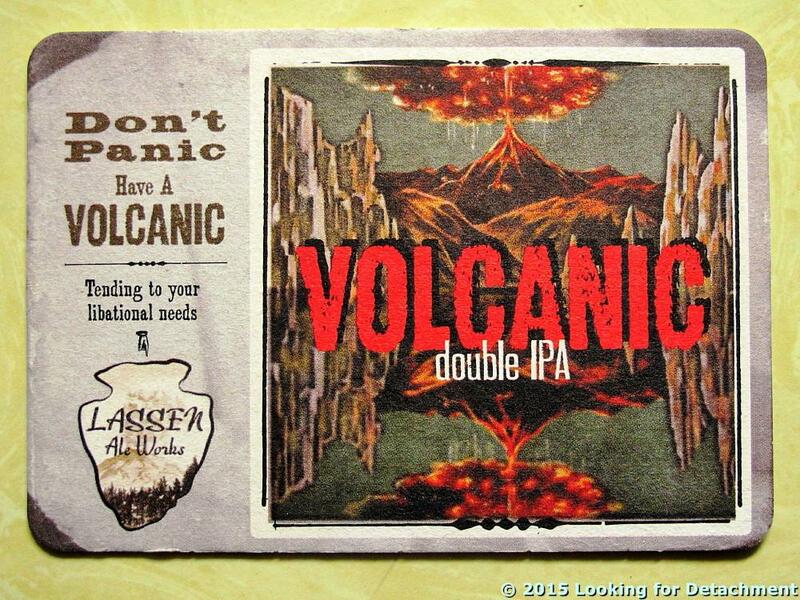 Volcanic Double IPA is a quintessential geo-beer, being all about volcanic eruptions and such. Possibly — given the location of Lassen Ale Works in Lassen County, CA (here are all their beers) — the volcano depicted might be a fiery representation of Lassen Peak, which erupted fairly spectacularly in May, 1915. The beer is quite hoppy and has a relatively high ABV (8.5%). Because of the latter, if you go directly to the source at the brewery, you'll get a relatively short glass of it, which is one reason I don't order it there (also, I do prefer the less hoppy, less alcoholic Eagle Lake IPA) — so if you want a full pint, go elsewhere or buy a growler to go or a six-pack in some local store. The Volcanic is currently (last time I checked a couple weeks ago) on tap at this establishment. Would love to try it, but chances are slim as I am in Georgia. The message is: Relax, if it's a basaltic eruption 10 miles away, you probably have time to enjoy your beer or take it with you, if need be. If it's a pyroclastic eruption headed your way, say a quick prayer while chugging your last beer. 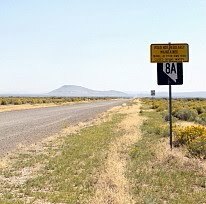 Yes...most likely someday....there are only three active super volcanoes in the US...the Long Valley, Yellowstone and Jemez. I have been to two of these three in the last year. Now these volcanics are much younger that the volcanic rocks that you and I used to map....say like those in the Hot Springs Range on the Crabtree Claim back in our Noranda days. So...speaking of beers...thought you'd like to know that Ray Lahti and I toasted many a Austin, Texas homebrews last month in Austin, Texas. We had a great time telling stories on each other but few were quite as good as the great "Claim-Staking" war we had with AMSELCO that one fine morning.....we were outmanned....but not outworked...we did some major claim staking that day....and some major beer drinking that night....LOL. Ray gave a talk at the session I was running at the annual SAGEEP meeting...I gave a couple of talks (BS of course) with some USGS co-authors on my Montana project. Then there's also the Clear Lake volcanic field north of Napa Valley, near ex-Homestake's McLaughlin Mine. That's still likely to erupt, possibly in a big way. I keep meaning to write about the claim staking war, but generally too busy working! Yes I am down in the oil patch...when Tenneco Minerals threw us out of the door in Carson City, I came out here and went to work as an oil and gas explorationist....I escaped in 1994..went to Oklahoma State and went through their hydrogeology program.....I promised myself I would never again work for an oil company or live in Midland, Texas and I went and did a stint working for NASA and the Department of Defense at White Sands, New Mexico....but the lure of the oil patch (and money...LOL) lured me back...so, so much for vowing to never do anything again. So here I am, back in Texas working on groundwater projects from Montana to South Texas for my current employer. Fortunately my job now allows me to spend a lot of time in the filed doing shallow geophysical work. downhole geophysical work, geochemical work, etc....and I get to spend a lot of time behind the rig looking at the rocks...and I like that a lot. I enjoyed visiting with Ray last month in Austin. I gave two geophysical talks one of which was on the applications of downhole geophysical l0gging...I had the Mt. Sopris guys from Denver in the audience as well as Ray. I use their tools a lot but I had to "gig" Ray in that talk about that old 1975 green and white Chevy Blazer that he "loved" so much....he had that ancient (well it probably wasn't at the time we were using it) Mt. Sopris in it. I remember that truck as being nothing but a "logging" death trap POS. Remember that truck? it had a permanent list to it from that huge, heavy monstrous drum logging recorder..the one that used the red ink pen on the chart paper that constantly leaked red ink everywhere. The insides looked like someone had been murdered in it. I remember the truck not only had a permanent list to it but it had the absolute worst steering on the planet...it would go from bar ditch to bar ditch in the mere blink of an eye without even turning the wheel....LOL. Of course as a young "bullet proof" minerals geologist right out of school I was usually driving in the bar ditch those day anyway. Good geology....good times....and they are still going on...that's the best part.